BROOKLYN — Friends of the vegan author who died after collapsing while jogging in Prospect Park are looking for the good Samaritans who helped him. Rynn Berry's loved ones want to invite the strangers who aided the fallen runner to a memorial service so they can properly thank them, said Berry's longtime friend Chris Abreu-Suzuki. "It would be very nice to meet these people," Abreu-Suzuki said. "We want to thank them and acknowledge their help. Rynn would like us to do that." Berry, 68, collapsed while running alone in the park on New Year's Eve 2013 and was rushed to New York Methodist Hospital after passers-by called 911. Berry was not carrying any identification with him, and he was hospitalized as a John Doe for more than a week while officials scrambled to identify him and find his family. After news of the unidentified jogger spread through New York's running community, several local runners visited the unconscious Berry in the hospital to see if they recognized him. Abreu-Suzuki said she contacted running clubs and the Park Slope running store JackRabbit Sports for help tracking down the anonymous do-gooders. Berry, who lived alone in an apartment on Eastern Parkway, was eventually identified by his half-brother on Jan. 7. He died two days later with his family at his side. The Medical Examiner's office has not yet determined the exact cause of death. 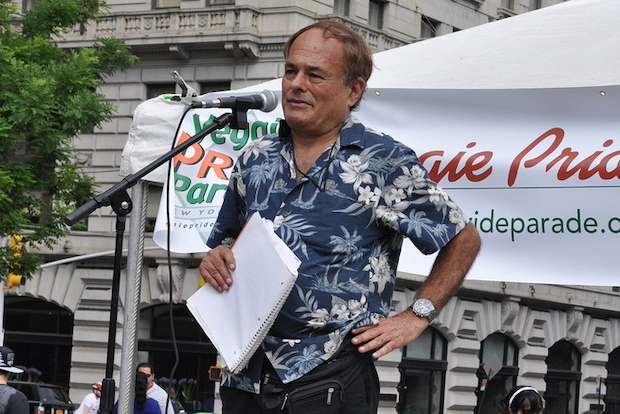 Berry wrote "The Vegan Guide to New York City" and was a well-known scholar and historian in the vegan community both locally and internationally. "He just was a very special person and there was no one like him," said Abreu-Suzuki, who was Berry's co-author on the vegan guide. "He touched many lives." In addition to the memorial service organized by friends, plans are underway to honor Berry at upcoming vegetarian events in Brazil and Portugal, and at this year's Veggie Pride parade in New York on March 30. Berry was a speaker at past Veggie Pride parades. Berry's friend Martin Rowe said the vegetarian-friendly event on March 16 would be a fitting tribute to Berry. "He would enjoy the fact that people were coming to learn about vegetarianism as well as honoring him," Rowe said. To reach Abreu-Suzuki with information about the people who helped Rynn Berry, send an email to achris123@hotmail.com.